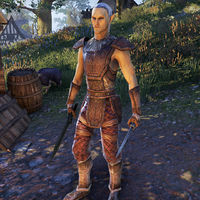 Journeyman Thetathor is an Altmer fighter and member of the Fighters Guild who resides in the Alcaire Castle branch. When spoken to, he'll say, "I know that a fight isn't always won by the soldier with the best weapons or gear. Your survival depends on skill." This page was last modified on 7 February 2017, at 20:41.